Takachiho Ravine (高千穂峡) is a valley located north-western Miyazaki prefecture. It is one of the most popular tourist spots in Kyushu. This ravine was created by volcanic activities of Mt. Aso. It has beautiful cliffs which are about 80m to 100m tall and its length is about 7km long. Manai Fall which is one of 100 best Japanese waterfalls run into this ravine. 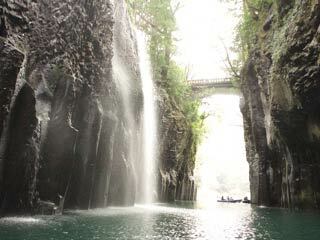 There is a boat riding which you can enjoy this waterfalls and cliff very close.